1. The WNC Flyer ride committee believes in keeping ride costs as low as possible for all cyclists in our region and community to be able to participate. So for 2019, we will not increase the cost of the ride registration fees. 2. We have noticed the amount of leftover food each year after our pre-ride party and we want to do our part in reducing waste from our event and helping our planet! With that said, we will continue to keep the registration pricing the same, and then have our post-ride meal as an additional add-on option for $5. That way if you plan to just ride and leave without eating, you will save $5 and we will have reduced the food waste. The ride will have three options for the post ride meal including your choice of BBQ, Vegetarian and/or Vegan lunch. For an additional $10 you can add-on a meal for your friends/family members that are joining you at the ride but not participating. We are re-vamping our vegan and veggie menu to have more options too! If you plan to stay after your ride to eat and drink, meals will need to be pre-ordered through online registration no later than May 23rd! 4. You asked for it! We now have bib shorts to go along with our commemorative, custom-designed Giordana cycling jerseys. Jerseys and shorts can be purchased during online registration. The deadline to order jerseys and shorts is Tuesday, April 9th at NOON EST. Net proceeds benefit the Blue Ridge Bicycle Club. The Hunter Subaru WNC Flyer is a a fund raising event for the Blue Ridge Bicycle Club who’s goal is to promote healthy living and bicycling in Western North Carolina. Monies raised are used to promote healthy living through bicycling and bicycle riding in Western North Carolina. If your organization has interest in being part of the 2019 WNC Flyer please contact us – wncflyer@gmail.com. *If you decide to change your ride distance, please contact info@racesonline.com and they can assist you with this switch. You will need to make changes by Monday, May 20th at midnight in order to have a personalized bib at the ride. Purchase your raffle ticket online when you register or on ride weekend. In 2018 we had some great prizes! We will update this section for 2019 in the Spring of 2019! Hotel Domestique and Restaurant 17 we have a "romantic" evening/night that includes a room, dinner for two and a complete Hincapie Sports kit. The Value is $1000.00. And from Cane Creek Cycling Components we have a component group including headset, their new eBrakes and more all incredibly light weight. The value here is also $1000.00. 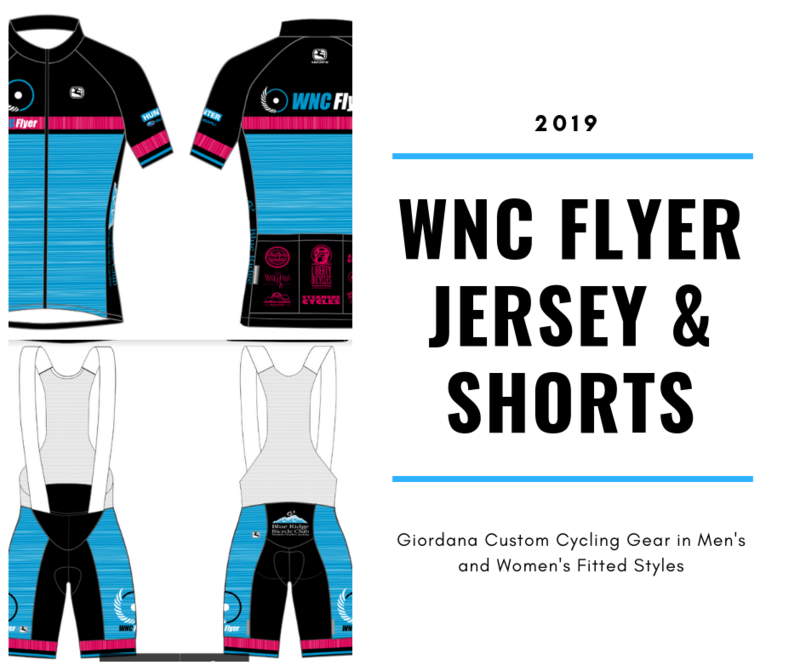 Commemorate your accomplishment with this 16th Annual WNC Flyer Commemorative Jersey made by Giordana Cycling. Available to purchase when you register online, in men's and women's specific sizing. Deadline to place jersey orders is Tuesday, April 9th at NOON EST. Size charts can be found HERE. Commemorate your accomplishment with the 16th Annual WNC Flyer DeFeet International custom-designed socks. The first 1,000 to register online for the WNC Flyer get a complimentary pair. Thank you for your willingness to help us at the WNC Flyer. We could use some help the week leading up to the ride and on ride day (Sunday, June 2nd) Volunteering and riding? Volunteer spots with a '*' means you can ride AND volunteer. After you have signed up to volunteer you can use the special volunteer code for a discount on your ride entry. VOLUNTEER HERE! There will be NO refunds for this event. Entries are non-transferable. Race Management reserves the right to cancel or modify the event due to unfavorable conditions. In the event of cancellation due to "Acts of God," registration fees are NOT refundable or transferable for the following year. Expenses for the event have been incurred and are paid up-front regardless if the event takes place or not. In the event of a natural disaster or "Act of God" that would prohibit the event from taking place, the event will not be re-scheduled, it would be canceled.